Although there is no worthy substitute for a solid oak pew end, considerable time and expense must be spent in the effort to maintain its quality. Most other manufacturers either cannot or will not bear this cost, but at The Marshall Company, keeping our fine reputation intact is worth the price. 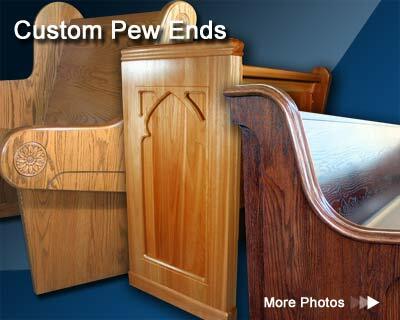 The Marshall Company uses only solid FAS Northern Red Oak or other specified hardwood in manufacturing its pew ends. 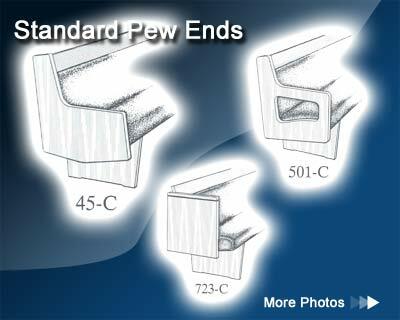 Marshall’s pew ends are made using 2 panels of edge glued hardwood, showing the true inherit beauty of the wood itself. We do not simply “butcher-block” our hardwood pew ends. We take the time and effort to insure it is done the time-tested way, and guaranteed not to warp, split, or check. In addition to our standard line of solid oak pew ends, we can also make your own design into a piece of furniture. Whatever style you specify, you can be assured of the highest quality of materials and craftsmanship. Whether a simple design change in a standard pew end, or the need for finely crafted, hand carved ends that are more like pieces of art, The Marshall Company has the expertise to make your vision into a reality. Web Site by Implied By Design LLC.